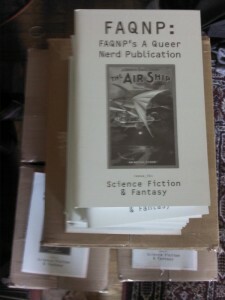 It’s been quiet for a while here at FAQNP. We’re not ending it all, but just taking a break for a while. 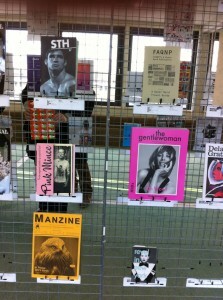 We’re so happy to be back at the Printed Matter‘s NY Art Book Fair at MOMA P.S. 1. 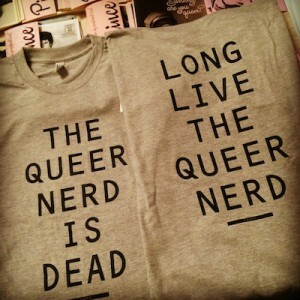 We’re launching Issue 06: Queer Nerds Visualized and a swell t-shirt… and hope you can stop by if you are in the area. 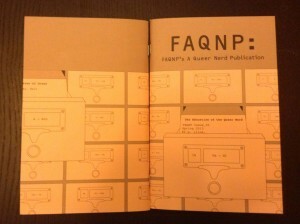 FAQNP is a magazine about and for queer nerds who feel outside the mainstreaming of queer culture. The publication covers the ordinary lives and interests of queers, because the ordinary is often quite interesting. Life is full of interesting people, things, and ideas, yet we are at times perplexed and left out by the tepid discussion and outlets of queer culture. The theme of the sixth issue is The End Game of Queer Nerds – Visualized. We’re seeking primarily visual (photography, illustration, graphic + information design) works, which explore the crash course of queer and nerd culture and the mainstream. Text submissions will be accepted as well, but should have a visual component to it. We take a broad approach to the topic, so just make it fun, smart, and nerdy. Still questioning, or curious? Just ask. On a more pedantic note on submissions, since this is self-funded project, we can’t pay for your words or art. We hope that we will able to afford that one day. You’ll also have to give us permission to use your submission as we see fit. (We promise to be gentle.) However, we can offer you, an outlet for your ideas, a couple of free issues, and our gratitude. Images and visuals are great too, just make sure that you take them, and/or have the rights for their publication. Please send submissions to: submissions@faqnp.com We would love to hear from you. 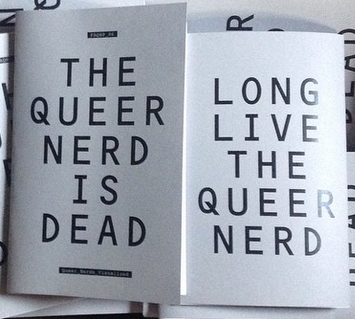 Issue_05: The Education of the Queer Nerd is here. Thanks to everyone who braved the cold and stopped by the release party hosted by the fine folks at the Bureau. They extended their pop-up store through February, so please stop by if you haven’t already. 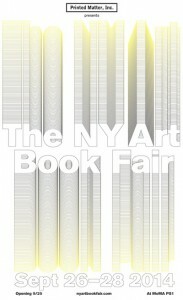 For those who aren’t in NYC, you can purchase it through our online store, and we’re also rolling it out to other store. 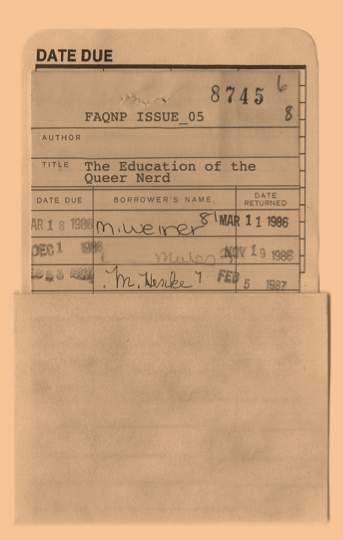 The release of FAQNP Issue_05: The Education of the Queer Nerd is *next week* on Wednesday January 23, 2013 from 7:00 – 9:00 PM at Bureau of General Services – Queer Division. Things are rolling at FAQNP, as we’re recovering from the launch of Issue_04: Science Fiction & Fantasy. Of course, we’re not done yet, and ready to dive into Issue_05 on education, just in time for summer vacation. 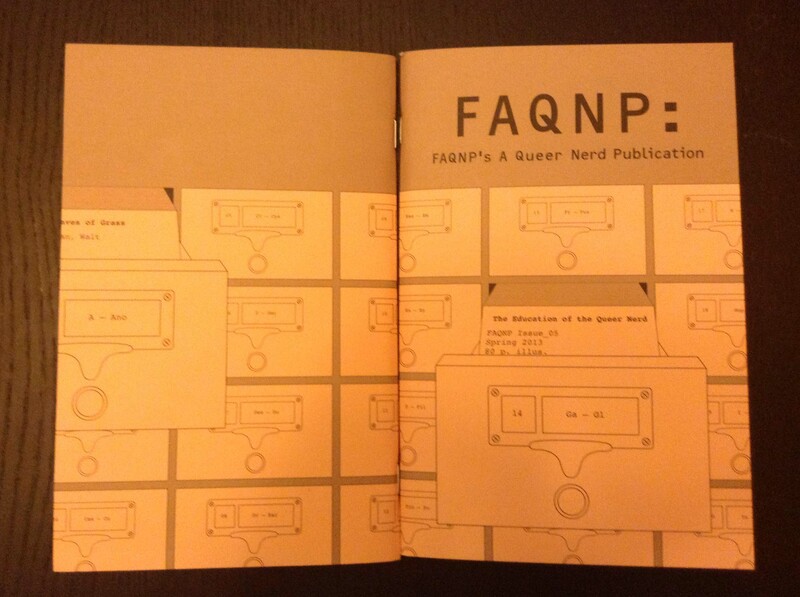 FAQNP is a magazine about and for queer nerds who feel outside the mainstreaming of queer culture. The publication covers the ordinary lives and interests of queers, because the ordinary is often quite interesting. Life is full of interesting people, things, and ideas, yet we are at times perplexed and left out by the tepid discussion and outlets of queer culture. 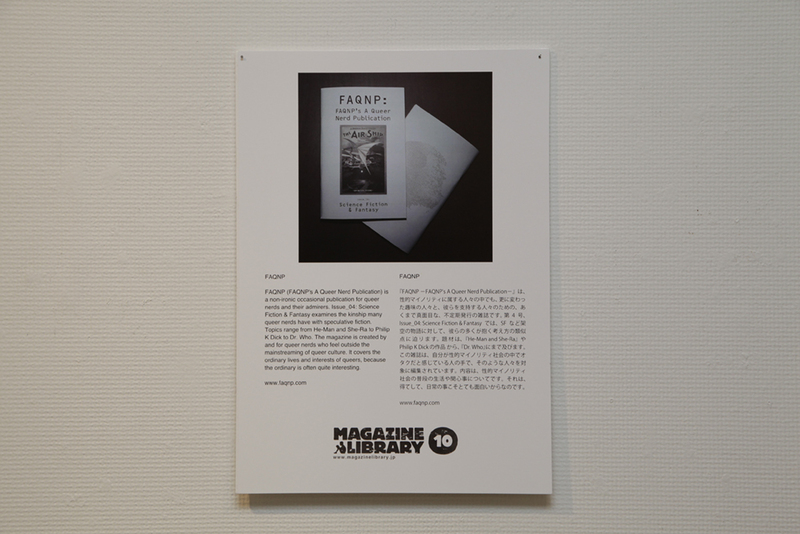 The theme of the fifth issue is education. We’re seeking photos and short essays (500 – 1000 words) your thoughts and experience about not only school, but education and learning as well. Teachers, educators, and librarians are especially encourage to submit. We take a broad approach to the topic, just make it fun, smart, and nerdy. However, we can offer you, an outlet for your ideas, a couple of free issues, and our gratitude. Photos are great too, just make sure that you take them, and/or have the rights for their publication. 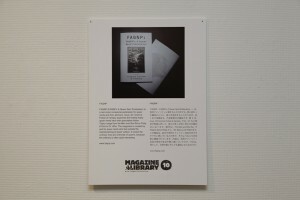 Magazine Library 10, Tokyo, Japan. Please join us at Printed Matter to launch FAQNP Issue_04: Science Fiction & Fantasy. 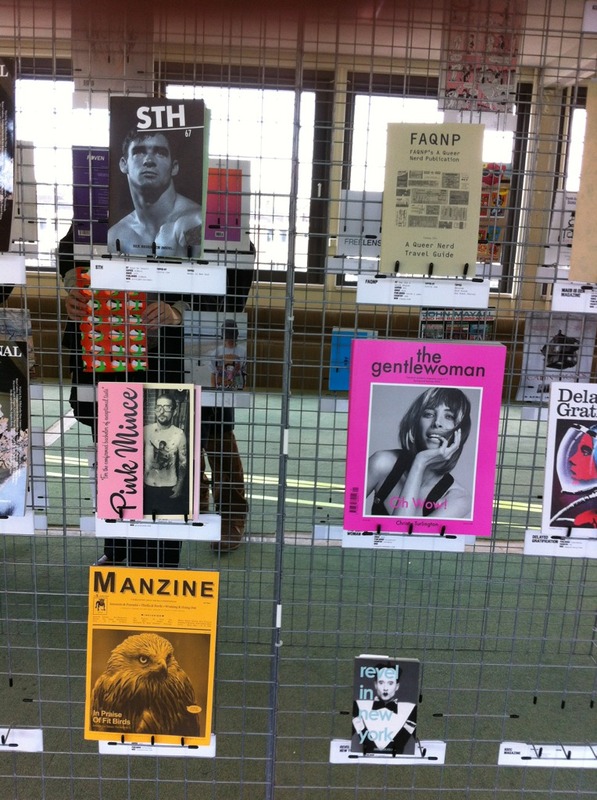 We hope you can stop by, pick up an issue, and support Printed Matter. 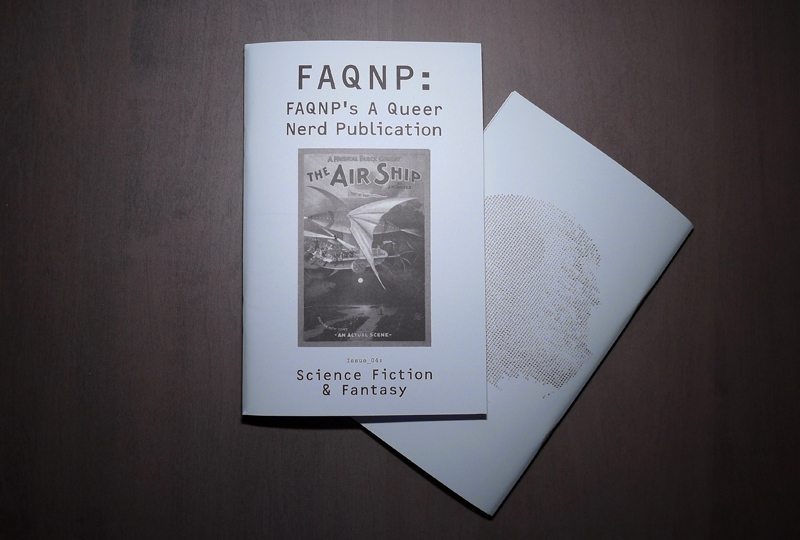 FAQNP Issue 04: Science Fiction & Fantasy is here!